With many financial markets off to a volatile start in 2016, our team has been fielding an understandable increase in calls from concerned clients. We’ve aggregated some of the most frequent questions and our responses for this month’s investment strategy update. While generic discussion points like “everything is cyclical,” “investing is a marathon, not a sprint,” and “be fearful when others are greedy and greedy when others are fearful” generally describe the key tenets of our patient, opportunistic approach, we appreciate that many if not most of you already “get that.” So what follows are some additional perspectives on how we view the current investment landscape, and how we are managing through these headwinds. As always, we appreciate the opportunity to discuss your individual situation and encourage you to contact us with questions or concerns. Q: 2016 seems to picking up where 2015 left off (i.e., not so great). Paul said at the end of 2015 that he was very optimistic about the outlook for 2016. Has FIM Group changed its tune given the rough first few weeks? A: As this newsletter goes to the editors (1/20), most global stock markets have indeed had a tough start to the year. Many markets, including those in the U.S., have fallen 5%-15%, while parts of the corporate bond market (mainly the lower credit rating segments), have also performed poorly. FIM Group-managed portfolios have not been immune to this sentiment shift among market participants. We came into the year close to fully invested in a diverse mix of stock and bond investments that are well-priced for good long-term total returns. Keeping relatively low cash balances and owning good quality holdings allows us to benefit from higher levels of dividends and interest and longterm price appreciation, just as owners of privately held businesses and real estate holdings do. But because we invest in public markets, the trade-off we accept for being nearly fully invested is more exposure to short-term downdrafts in portfolio market value when fear infiltrates market psychology. Our focus remains largely on the fundamentals of our portfolio holdings (including things like their competitive position, cash flow generation outlook and balance sheet strength) and the market’s valuation of our positions. We see little evidence of any broad deterioration in our portfolio holding fundamentals, and in most cases the long-term outlook for increases in fundamental measures we monitor, like book value per share and dividends per share, remains intact. As long as this stays the case, slides in market value do not curb our optimism toward future returns. In fact, as the gap between market price and fundamentals widens, our optimism toward future total returns (dividends and interest + price appreciation) only grows. Q: I’m still many years from retiring, and I’m saving responsibly. Why should I put more funds into FIM Group managed strategies after the subpar performance of the last 18 months? A: Although we had a few dud investments in 2015 that were simply company-specific analytical misjudgments on our part, the lion’s share of the headwinds we faced came from areas that we deem cyclical rather than structural in nature. Namely, these headwinds included U.S. dollar strength relative to most other currencies and commodities, weak price action in areas perceived as sensitive to interest rate changes like real estate investment trusts and infrastructure stocks, and companies with high exposures to emerging market customers. While the jury remains out on the duration of the headwinds in these areas, we expect them to eventually cycle back to our favor. New money flows coming to FIM Group today (including cash that our team members are investing into FIM Group-managed strategies) are being put to work in a mix of holdings that includes good-quality holdings in these beaten-up areas where the forward return outlook is as compelling as it’s been in years. We are buying mission critical infrastructure and service providers like hospital and senior living REITs, water utilities and alternative energy assets at exceptional prices. We are also using the strong dollar to buy international leaders in areas ranging from European public transport, to Asian healthcare and even (for Growth strategy accounts) Russian Internet search engines. In short, we are finding no shortage of good-quality, well-priced investments in a broad mix of areas, some of which are poised to benefit substantially as the dollar, interest rate sensitivity perceptions, and emerging market sentiment shifts back our way. Q: I’m retired and depend on my FIM Group-managed portfolio to support my cash needs. Should I cash out and stay on the sidelines as this latest storm plays out? A: This is a question that should be discussed directly with a FIM Group team member, as each client situation is different. Generally, though, the strategies we typically manage for clients taking modest distributions (for example, 4%-6% of the portfolio value in “normal” times) from their portfolios each year (namely Balanced, Balanced Conservative and Yield Income) are structured to allow such distributions during even the most challenging of market conditions (like those in 2008- 2009). We structure these portfolios to generate solid, recurring dividend and interest yields throughout the year. Many of these dividend and interest streams derive from long-term contracts with diverse groups of financially sound counterparties (such as is the case with our REITs, infrastructure and corporate bond fund investments). We also normally have allocations to “safe haven” U.S. government bonds or notes that tend to hold their value or appreciate in times of market stress. These recurring dividend and income streams and safe haven assets allow us to fund distribution needs as other parts of the portfolio recover from sentiment-driven sell-offs. The benefits from such an approach are chiefly twofold: 1) We can avoid selling assets at fire-sale prices to meet distribution needs (i.e., avoid permanent loss); and 2) We can avoid having to “time the market,” making massive portfolio shifts out of investments and into cash (and then back), which history shows is the number one way to transfer wealth to other investors who can stay patient through stressful market conditions. Q: Should I change investment strategies to something with less drawdown risk? A: Each of FIM Group’s four core strategies (Growth, Balanced, Balanced Conservative and Yield Income) is designed to accept varying degrees of drawdown risk (temporary drops in portfolio value). These are not guaranteed loss limits, but rather are parameters by which we structure the mix of investments in each strategy. These volatility thresholds are 45% for Growth, 30% for Balanced, 25% for Balanced Conservative, and 20% for Yield Income. While it is not ideal to shift strategies during panicky financial markets, it is important that we manage a strategy suitable to your tolerance for these drawdowns. The main reason for this is that we want to avoid situations where the volatility becomes too much to bear and drives a decision to turn temporary losses to permanent ones. Like the question above, each client situation is different, so please call a FIM Group team member if you would like to discuss a possible strategy change for your accounts. Q: We continue to hold considerable allocations to international holdings. Yet everything I read points to a good chance for further dollar strength against most foreign currencies and headwinds for my portfolio. What am I missing here? A: The dollar has been in a very sharp upward trend since mid- 2014, appreciating more than 20% against a broad group of other major currencies. As our international holding allocations generally range from 20%- 60% in our core strategies, this dollar surge has led to a currency translation effect that has temporarily impacted portfolio returns. A generally stronger U.S. economy compared to other major economies like Europe and Japan, along with anticipation of diverging monetary policies (tightening in the U.S. vs. loosening in Europe and Japan), have been key factors behind the dollar surge. As Figure 1 shows, the dollar is now above its 40-year average levels. It has rallied 40% off its 2008 lows. The previous cycle higher in the dollar was a six-year affair from 1995-2001 that saw the dollar strengthen by 45%. Could this cycle prove longer and of greater magnitude than the last? Sure it could. The four-year dollar bull from 1980-1984 saw a 77% move higher. But generally speaking, with the dollar now above its long-term averages, we are more likely to see less of a medium-term headwind effect from foreign currency translation. And with valuations in other parts of the world in many cases providing significant discounts to U.S. holdings, we will continue to keep high-quality international holdings in our mix. Q: Financial media continues to report on an economic implosion in China. What is FIM Group’s view on this, and what is my portfolio exposure? A: China’s economic transition from a capital investment and export-dominated model to a domestic consumption-driven one is having major implications for markets around the world. The primary impact has been to commodity producers as demand has ebbed for the raw materials that were needed to support the capital buildout and export machine. No country that has grown to China’s scale can sustain double-digit economic growth forever, so we should not really be surprised at China’s now sub-7% growth rate. 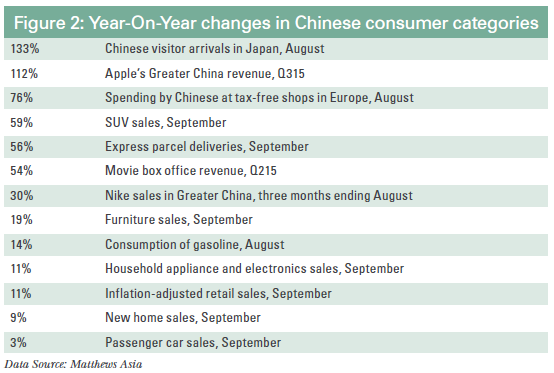 But what many of the sensational headlines miss is that China has been rebalancing for some time into a more sustainable economic model and that consumption across many categories is thriving there (see Figure 2 and Figure 3). Our managed portfolios have little direct exposure to China, ranging from less than 1% in Yield Income to just over 5% in Growth. The exposure we have in China is generally via U.S., Singapore and Hong Kong-listed companies with leading niche positions in areas like e-commerce (Vipshop), wellness goods (Eu Yan Sang and OSIM), household paints (Yip’s) and mixed-use development (CapitaLand). We have confidence that as the negative headlines around China become less dramatic, investors will return and market values will better reflect the solid long-term outlooks for each of these holdings. Q: Why do I keep seeing increasing trading activity in my account, including simultaneous buys and sells on the same day? A: When other investors get panicky and when market prices move significantly below our assessments of fair value, we seek to be opportunistic. This generally means we like to bargain hunt and buy when “blood is in the streets.” In some cases, to take advantage of great prices, we will rotate from holdings with less risk-adjusted return potential to make room for those with superior potential. That is why you may see us sell and buy on the same day and even sell certain holdings at a loss as we look to refine your portfolio and improve its outlook for future returns. Q: You keep telling us there is “underappreciated” value in my portfolio. Can you elaborate with an example or two? A: We regularly profile investments each month in our newsletter’s Investment Team Spotlight section. John Bresnahan writes about one such investment this month in France-listed FFP Holdings. During our autumn webinar in October (archived on our website), we also discussed holdings where value “surfaced” via corporate actions like the announced deals with Cable and Wireless (to be bought by Liberty Global), Saizen REIT (taken private) and Strategic Global Income Fund (proposal to liquidate at NAV). And today (1/20), another holding, Capstone Infrastructure, which we first bought last July, announced that it would be taken private at more than a 40% premium to its recent market price. In each case, our holdings were trading like a coiled spring at market prices well below our estimates of fair value before they “released” to reflect a value more in-line with their fundamentals. And while we surely can’t bank on corporate actions to be the only catalyst for “surfacing” the value in our portfolio, such transactions do often act as a wake-up call for other investors looking at similar names. We are happy to discuss our analysis of the unrecognized value of any holding in your portfolio, whether it be mission-critical infrastructure like hospital REIT Medical Properties Trust, the deeply discounted natural resources turnaround situation at Dundee Corp, niche industry leaders like Cott Corp (private-label beverages) and SunOpta (organic food ingredients), and unusually highly discounted closed-end funds like Western Asset Inflation-Linked Opportunities (WIW).